Mint state and key date listed Capped Bust Dime values is for graded, certified and authenticated coins in PCGS or NGC holders. The rest are a sample of raw coin sell but this is not a guarantee your coin with the same date, mint, grade and holder will sell for this exact value. All Capped Bust Dimes are low mintage with none over 1,410,00 so each date is worth a premium over their melt value. Usually a raw coin will be worth at least $35 in the G4 (Good) grade and sometimes a little less if they’re cleaned or damaged in some way. You will find many that are damaged, extremely worn and cleaned, and this does decrease their value. 1822 is the key date of the series and worth around $1,400 in the lowest values and 1809 is not far behind but must be a grade or two higher to realize the same premium as the 1822. Capped Bust Dime value for proofs is extremely high with all of them being worth at least $8,000 in PR60, but not all dates have a proof counterpart, so potential proofs should be checked by an expert or certified by a reputable grading service. Grade is all important and and grade condition coins are the rarities in this series, and are a huge factor in Capped Bust Dime value. For example, 1835 is rare but is common for this series with a starting value around $30 in G4 but in AU (Almost Uncirculated) it’s worth around $350 and in MS63 (Mint State) it can sell for around $1,600. You have some valuable varieties in this series but not all varieties are worth more, in example, the 1811/09 is worth less than the normal 1809, but this is the exception rather than the rule. 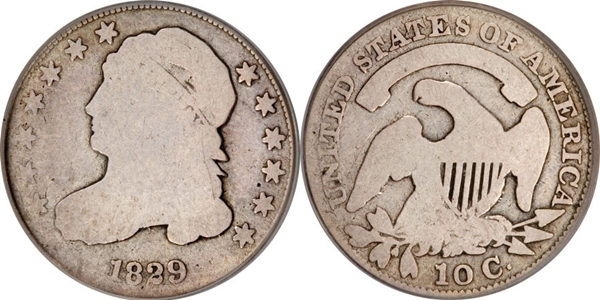 The most valuable and sought after variety is the 1829 Curl Base 2 with a starting value of over $6,000, and you have several other values that don’t reach their value potential in the lower grades but do increase dramatically in high grades. Capped bust Dime value facts.